Check back to this page for future announcements. Any announcements will be located under "Notices". CUBS provide implementation and maintenance support for strategic administrative applications at Clemson. The core systems include PeopleSoft Financials, PeopleSoft Human Resources, Payroll, Data Warehousing/Reporting, Kronos, InfoEd and TigerOne Card. CUBS customers include the University's Business Offices, including the Registrar's Office, Controller's Office, Human Resources, Payroll, Office of Sponsored Programs, Students Affairs,. We provide technical support for the systems themselves with functional support for users. Our overall goal is to provide systems that enable smooth, seamless administrative support for the teaching, learning, and research efforts of Clemson University. Windows 10 and the Microsoft Edge browser have been certified for use by PeopleSoft. You can also use the IE 11, Chrome or Firefox browser with Windows 10. Technical staff work to gather compatibility information with Oracle and will provide updates about browser compatibility as they become available. Be aware that if you use one of the browsers not certified by PeopleSoft, you may not be able to properly access some of the CUBS applications. 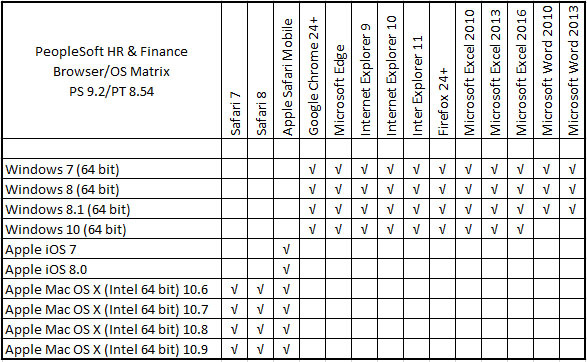 View the list of the currently supported browsers at the bottom of this page. Please contact the CCIT Help Service Desk with any technical questions at (864) 656-3494 or email at ITHELP@clemson.edu. If you are off campus or not on the CU network, you will need to log into the Virtual Private Network. (from https://cuvpn.clemson.edu) first before logging into the Financials system. Users not on the Clemson network may now access the CUBS HR system, including the employee self-service portal (paycheck, W-2, etc. ), using the Virtual Private Network. If you need login assistance or have a problem, please email the Helpdesk at ITHELP@clemson.edu. For questions about Data Warehouse Reporting, please email DWHHelp-L@clemson.edu. Each month on Wednesday after the second Tuesday in the month, beginning at 10:00 PM Engineers will be applying monthly patch updates for all Non-Production Windows and Linux environments unless a server has an approved exception. During this maintenance, there will be a disruption of service for all dev, uat, upg applications until patching is completed. All patching and update maintenance should be completed by 7am the next morning. Each month on Wednesday after the third Tuesday in the month, beginning at 10:00 PM Engineers will be applying monthly patch updates for all Production Windows and Linux environments unless a server has an approved exception. During this maintenance, there will be a disruption of service for production applications until patching is completed. All patching and update maintenance should be completed by 7am the next morning. Accessed via the web, Clemson University's PeopleSoft system is not platform-specific but does work best with recommended browsers. Students, faculty, and staff all interact with the PeopleSoft system via their Clemson ID and password. Guest access is available for applicants via the external applicant's careers page. Users are strongly encouraged to use these recommended browsers, as other browsers may not be fully compatible with PeopleSoft. Note: To have multiple IE windows in ONE PeopleSoft environment, use PeopleSoft's "New Window" link, do not use windows cntrl-n.
All IE browsers will share cookies and PeopleSoft will function properly. Copyright © 2016 Clemson University, Clemson, SC. All Rights Reserved.